Universe Kogaku has a complete line of off-the-shelf, manual photographic lenses with various focal lengths, which are an economical alternative for large format CCD imaging applications and line scan cameras. The new lens assemblies meet demands for special applications which need CCD sensors larger than 1 inch (16 mm: diagonal), up to 35mm film size with 6144 elements on a 7 micron pitch (43.3mm: diagonal). 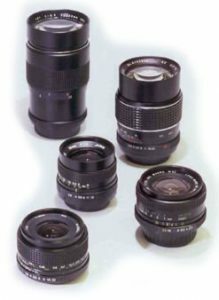 Lenses are available with U mount or Nikon F mount in a variety of focal lengths: From wide 24mm (F/2.8), to telephoto 500mm (F/8.0), to a 28-300mm zoom lens (F/4.0-6.3). Applications Include: Photographic lenses for large format CCD imaging-standard and custom designs.